He received his first painting lessons under Haralambos Pachis (1872-1875) and completed his studies in Italy. 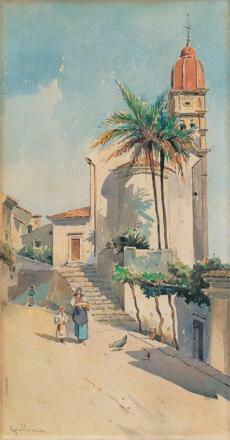 He settled on his native Corfu in 1878, while also travelling to other countries and making landscape paintings. His meeting, in 1886, with the British ambassador Ford was a turning point in his career. The latter commissioned him to make seven books of landscapes from Istanbul, Rhodes, Venice and Spain, organised exhibitions for the artist in Athens and abroad and introduced him to European royal courts. Giallinas established the Corfu Art School (1902) and made wall-paintings at the Vraila mansion, the country home of Empress Elisabeth of Austria on Corfu (1907-1908). The Angelos Giallinas Art Gallery is in operation on Corfu. One of the supreme Greek watercolourists, he distinguished himself as a poet of landscape painting, mainly of Corfu, painting sensitive images characterised by compositional equilibrium, clarity of colour, subtle tonal gradation and meticulous attention to detail.